The destination was a reasonably new yet perfectly located Travelodge within steps of the venue, and close by to a legendary local hostelry the Coopers Arms into which we dove gratefully as last orders approached. The next day saw a remarkably comprehensive breakfast buffet consumed before our small yet perfectly formed army made it out onto the table. Well, not entirely as perfectly formed as we intended, as having had one practice game (splitting the army in two and having both halves play each other) we had made multiple changes to improve our initial list.... which I had then forgotten to re-pack after a hectic week of work-related travel. 2 allied commands of Parthians and Armenians (pretty much identical with 4 LH bowmen and 3-4 Cataphracts. All our generals were competent, and we had forgotten to include the apparently compulsory fortified camp. The lists for the Triumverate Roman & Jewish and Romano-British & Patrician from this game, as well as all the other lists from the games at Burton Doubles can be seen here in the L'Art de la Guerre Wiki. Game 1 saw the Romano-Jewish forces playing a later Roman army with British allies, on a fairly bald table. Our idea to change the army after the practice game would have seen us using spearmen instead of imitation legions which would have been much better against the hordes of charging cavalry that faced us across the table. The enemy had also deployed deeper than the 5MU from the middle deployment distance, meaning our infantry would have to make haste to get to grips with their relatively weaker foot - but with both our Cataphract commands on the left we at least has a theoretical way of pressing the attack, whilst our rough terrain troops hung back on the right. The armies line up with the Romano-Judeans setting a strong centre of legions, and a more aggressive left flank of both Cataphract commands. Their rough terrain troops are on the right, but have relatively little rough terrain to hid in. The Romano-British have most of their foot in the centre, and have divided their mounted onto both flanks, ut are favouring their left opposite the Romano-Judean rough terrain commands. 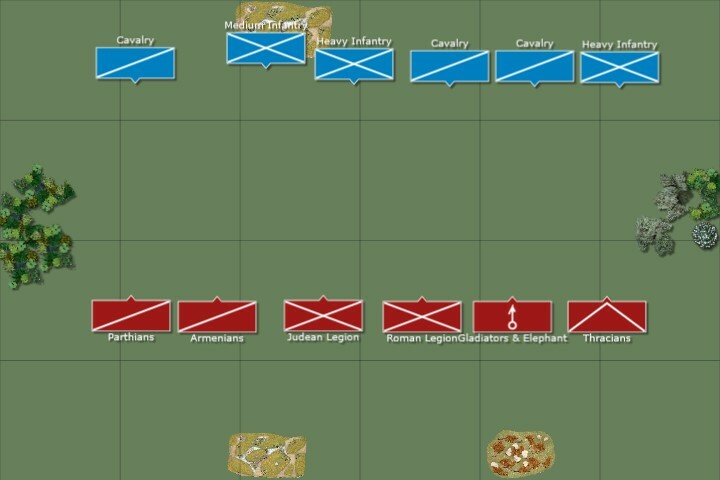 The enemy had sent out a traditional skirmish screen - both sides were trying LH in blocks of 4, having worked out that LH could shoot in 2 ranks. But, the table was wide and so with relat8ively few skirmishers there was a distinct potential the enemy skirmishers could be surrounded and cut off. L'Art de la Guerre hint - command distances vary in line with a generals ability, but are always doubled when issuing orders to light troops allowing your skirmishers to operate further in advance of your main battle line. This saves Generals elements from having to float around in the middle of the field quite so much. With a gameplan that involved getting our Legions into the Sub-Roman British foot as quickly as possible and then letting the dice decide the winner, the lack of enthusiasm of the Patrician and British foot to engage with this wizard wheeze was already becoming concerning - and when some of the enemy pedestrians decided to pedesrianize themselves away over to our right thus removing a rather squishy unit of poor bowmen from the front lines and placing them in a position of safety our plan became even trickier. Luckily, when it came to the planning department, our tri-faceted army was deep into binary figures in terms of the number of plans they had available to deploy at any one point in time. With almost nothing now defending the edge of the Patrician infantry our Partho-Armenian left hook had plenty of targets to aim at. Hoping to help their cataphract overlords the Armenian LH started to pepper the Patrician pedestrians with p-shaped arrows in order to piss them off and prevent them playing a proactive role in the upcoming process by dint of their previous cohesion losses due to ....shooting. Yes, the rough terrain force on our right had gotten bored and over-confident and has moved up... drawing in the Patrician cavalry to harass the potentially vulnerable medium foot. 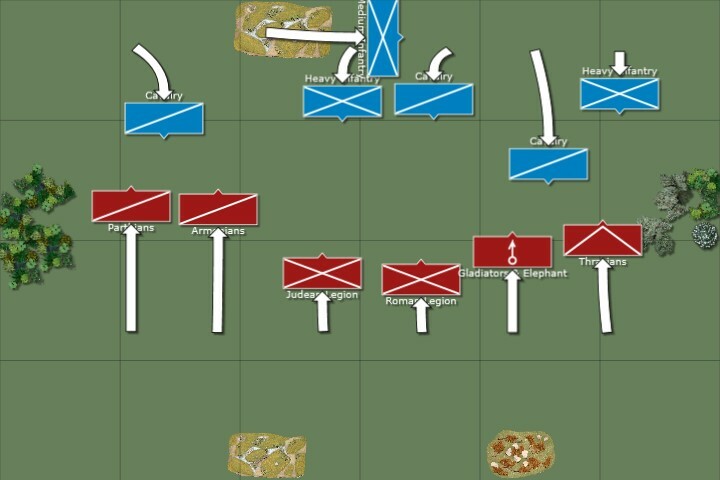 Our right flank has the numbers to push on past a handful of horse, but must be mindful of exposing its flanks as it advances and so it would be far better to force the enemy LH to retreat of their own volition rather than charge them away and risk ending up out of sync with the rest of the line. The Roman-Judean forces are advancing steadily, but their rough terrain flank has been compelled to advance out of its protective terrain by the need to protect the flank of the main Legionary block. This exposes them to the Romano-British cavalry, who are moving up to meet them. the Romano-British have also withdrawn infantry from their right, out of the path of the advancing Legions which leaves just a small mounted force to oppose the Parthian and Armenian advance on the Roman-Judean left. The enemy mounted bowmen roll well in shooting, and our Thracians roll extremely poorly all along the line - the result is a temporary spike in the price of black market green cohesion markers as demand almost outstrips supply on our right flank. 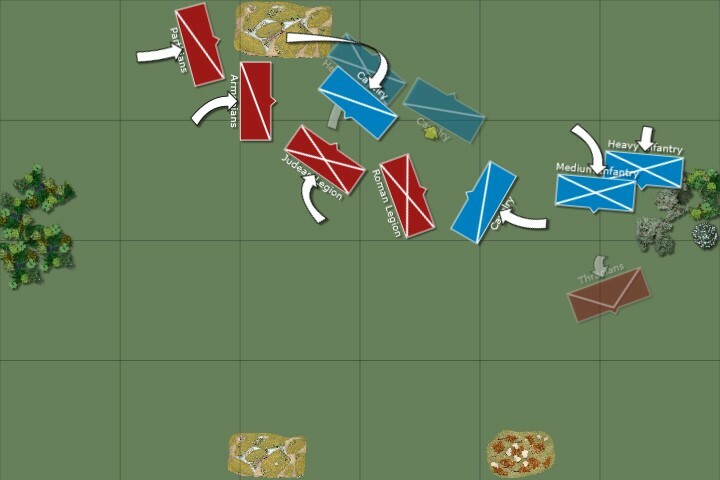 Holding off mounted troops in the open is a tricky proposition for medium foot in any wargames ruleset, but with potential -1's to combat for everyone who already has marker this job has suddenly become far more complex in this specific game. With their flanks threatened some of the cavalry fall back, but others, emboldened by their shooting prowess go in...and cause real, base-losing casualties to the embarrassed Thracians. This could be a serious hole in the line unless something can be done to shore it up. And the shoring appears, in the shape of a unit of Gladiators, not seen on table for ages but now riding (technically walking) to the rescue and making a telling flank assault on the already-engaged Roman cavalry. The rest of the Thracians are almost overrun but with a threatened flank from the aggressive Gladiators it might be a bit more tricky to continue their attack. Whilst the messing around on the left right has been playing out, the Partho-Armenian advance has been ongoing, and the two forces of cataphracts are now already in sight of the back of the table. The enemy Heavy cavalry who face them do not fancy these odds and are forced into the ignominy of a retreat through a ploughed field (actually a really sensible and clever flank refusal tactic against cataphracts who are significantly more susceptible to rough terrain than normal cavalry. The Roman-Judean rough terrain troops are being roughly treated by the Romano-British cavalry facing them, and the main Legionary block is still some way short of getting into combat. The Romano-British right has adopted a full-on skirmishing and screening role to delay but not engage the 2 Cataphract commands facing it on the Roman-Judean left. Our right flank is looking increasingly embattled as the Patriciano-Brits have now redeployed the infantry to bolster the great advances that their cavalry have already made against our supposedly rough terrain troops in the open. As the Gladiators and Thracians struggle to regain coherence the Patricians move up a neat 3-wide block of dangerously aggressive Auxilia as well. The right flank was in meltdown, and with the enemy Auxilia poised to charge there was a real risk the whole thing could be shattered before the elephants could even get into contact with the Cataphracts they had their beady little eyes on. 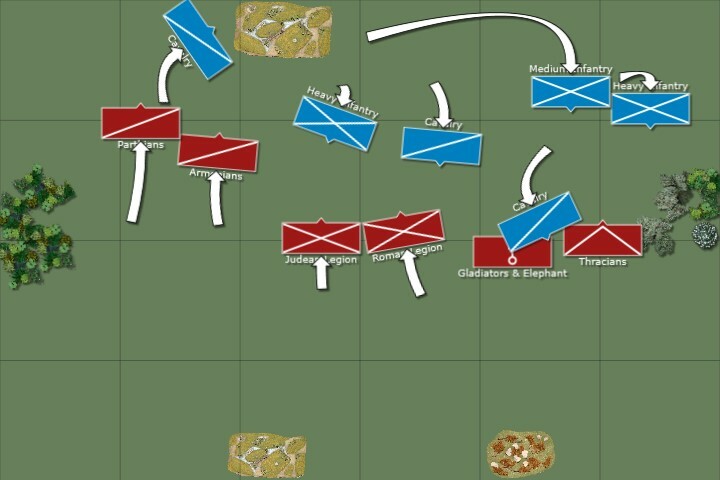 With pips at a premium and with half an eye on losing slowly so the legions flank could be protected for as long as possible the Inferior Elephant, already carrying one hit, raced forwards alone relying on factors and the classic elephant-induced disorder to make up for 2 enemy overlaps . L'Art de la Guerre hint - Elephants can't rally off their hits. This makes them into something of a glass cannon in game terms, and means you really have to protect them with a screen of light foot if you want to get them into combat at full effect. This is a really neat and elegant mechanic. Everyone was now rather over-excited to find themselves playing in a set of Ancients rules that had brought back the concept of ELEPHANT RAMPAGE!!! for when the pachyderms died. Yes this classic wargames mechanic not seen since the dog days of 5th and 6th edition, where the elephant routs in a random direction (including straight forwards) when dying, is back! Everything in the Patricio-British army seems to be outnumbering everything in ours as the wall of infantry joins a wall of cavalry on our right flank to try and mop up the remaining Thracians and LMI spearmen. 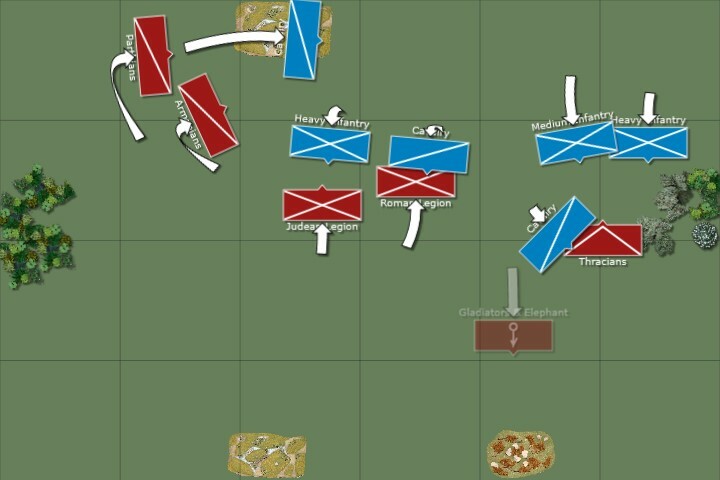 The Roman-Judean right flank is being shredded by the Romano-British cavalry facing them, but at least now both Legionary blocks are engaged against what should be weaker opponents. The 2 Cataphract commands on the Roman-Judean left have still not caught up with the enemy cavalry, who have withdrawn across a ploughed field, but in so doing the left flank of the Romano-British infantry line has become exposed and some Cataphracts are now teeing up to support their Leginaries in a flanking assault. The Imitation Legionaries join their Roman brothers and wade into the line of waiting Romano-British spearmen as the cataphract commands also swing round. They have been delayed by the skirmishing British mounted and messed around by the ploughed field but now they are in prime position to join in with a classic envelopment that will hopefully go some way to recovering the serious numbers of casualties racking up on our imploding right flank. On that flank 11 enemy units converge on just 4 of ours - the only saving grace is that this combat is hopefully taking place so far away from the rest of our lines that the near-term victory that is surely coming for the Patricio-British coalition forces will not be followed by a rollup of our right by the Roman cavalry. Our allied cataphracts are doing much better at being in the right place at the right time, and the British spearmen feel the full force of a frontal legionary assault and a sharp dose of heavy metal horsemanship in the flank. The Patricio-British line is sprouting markers at a rate which would make an M&M's addict blanche. But their frustration about lack of opportunity to demonstrate their martial prowess is nothing compared to that of the two sets of legionaries - they carve their way through the British foot like a hot Italian knife through soft cheddar! One lone infantryman survives, under the rather disapproving eye of his own general who is not best pleased with the weak effort of the rest of his men in this fight. The collapse of our right flank has completed, and with a burst of speed and pips the Patrician cavalry fall on the flank of the legionary line ! Its a two-ended double roll-over jackpot this week folks, with no-one really sure who will draw the winning ticket! Our dead populate the traditional riverine casualty storage area on our right flank as the enemy leave only a General left out of what was once a potent Thracian and Peltast force. The action has been fast and brutal, and both sides have stacked a flank and turned the enemy - the game starts to look like a 200 point battle played on a table spun 90 degrees to the initial setup as the winning flanking forces converge on each other to try and fight the decisive Ragnarok-like combats to determine the winner of this epic struggle! Will it be our cataphracts who come out on top after they battle their way through a dogged and brave rearguard action from the British heavy cavalry ? Or will it be the Patrician horse, who have reformed into a highly pip-effective and coherent line and are preparing to "unleash hell" on the rapidly redeploying high quality Marian legionaries ? The Roman-Judean right is wiped out allowing Romano-British cavalry to fall on th flank of the line of Legionaries to devastating effect - although the Romano-British foot on this flank are now too far out of the action to have a further impact on the game. Both Legions have destroyed their opponents, aided by the 2 Cataphract commands on the Roman-Judean left, and the skirmishing force of Romano-British cavalry which held up the Cataphracts for so long is forced to throw units into the malestrom in order to prevent the Armenians and Parthians having an uninterrupted run at the Romano-British baggage camps. The Patricio-Brits are doing their best to make sure it's them, as legion after legion falls to the rapid advance of their cavalry. Now only one unit of "proper" legionaries is left as the unbleached linen sleeves of the Judean Imitation Legionaries enter the crosshairs of the Patrician lancers. The Cataphracts also are staking a strong claim, forming their own coherent line and piling into and past the British cavalry who have nowhere else to fall back to, and so revert to queuing up in a pale pastiche of national stereotypes. With both wings now having smashed through their opposition, a climactic battle between Partho--Armenian cataphract technology and Patricio-British lancer enthusiasm is mere moments away .... as time is called across the whole hall and the game times out. The Result is a 42-51 loss for the Romano-Judean forces. I am most pleased by this outing, as even if it did not result in a win for my brave legionaries at least a Roman army ended up on the winning side in this technically drawn result. The troops we had at our disposal were perhaps not those we had expected or planned, but they did fight bravely, often right up until the point they were destroyed. More importantly following so close on the heels of the lets face it, somewhat slugfest-esque battles of the future which took place in the Godendag Doubles we can now be confident that with faster moving, less infantry and knight-heavy armies in play that the 2 x 200 AP version of ADLG is in fact a pacey game with scope for swift envelopments and strategic movement during the course of the battle. With the benefit of having now placed all our troops on the same side of the board at least once I am sure that in the next games we can perform even better ! I rage at your slack-jawed foolishness in this impotent display of bamboozling incompetence. What kind of mental wind-breaking passes for thought in an alledged "general" who decides to place his Cataphracts opposite a muddy field? What offal-splattered scenario sees enemy infantry redeploy themselves across the entire width of the battlefield whilst your own mounted troops have not the wit to do else other than roll forward as if on rails that constrain their imagination more tightly than any corset? You are naught but a corpulent pie eater, and I dare say that a cold cup of beans brought across the road from your hotel breakfast could have come up with a better plan than this one.